Dodge made a decent splash with the 1966-1967 Charger. For Dodge this was new territory and it was a learning experience. The original 1966 Charger wasn’t the big hit that the Pontiac GTO had been in 1964, but it did forge a new direction for Dodge which was trying to shed its then stodgy image. The 1966-1967 Charger was stylish especially with its fastback roofline and hidden headlights. Not to mention it had the muscle under the hood to make it a true performance car. This of course was when the Charger was equipped with Chrysler’s 383 cubic-inch V8 or 440 cubic inch V8, or the mighty 426 cubic inch Hemi V8. Production for 1966 was a surprising 37,344 units. This success was short lived, while other performance cars were seeing big production number increases for 1967, Charger production dropped to a meager 15,788 units. For 1968, Dodge released a new Charger body style, it would not only cause a massive skyrocket in sales to 96,108 units, which was almost six times 1967 production, it gave Dodge true muscle car credentials. Not only was this new boxy styling with a semi-fastback roofline stylish, it gave the Charger a tough, no nonsense “Don’t Tread On Me” look. Retractable headlights and perfectly placed curves and edges gave the body styling that perfect look. This look was backed up by some of the Chrysler Corporation’s most legendary muscle car engines. However that would have been enough for most automakers at the time but not Dodge, it offered the ultimate performance car package with the option “R/T” package which was short for Road and Track. The Charger R/T would not just focus on straight line performance but would also emphasize finely tuned steering and handling. Dodge’s aim was to offer the ultimate road and track car hence “R/T” was the perfect name. With the R/T package Chrysler’s potent 375 gross horsepower big-block 440 cubic-inch V8 was standard. 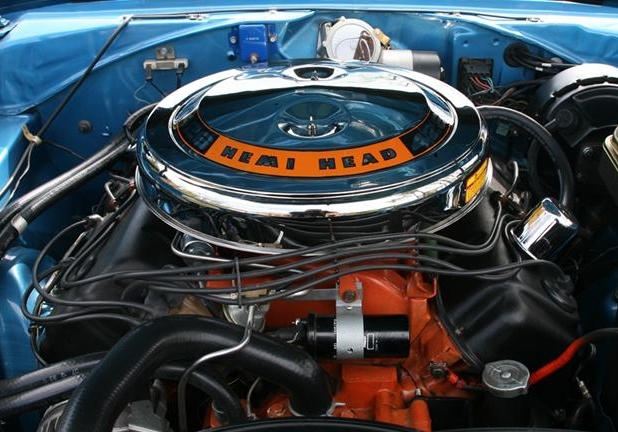 Chrysler’s “Big Kahuna” engine, the 425 gross horsepower big-block 426 cubic-inch Hemi V8 was optional. The 426 Hemi was capable of a mid-13 second quarter mile time at a little over 100 mph. The 440 was good for a high-13 second quarter mile time at just over 100 mph and the 383 was a little less than second slower than 440 in the quarter mile. All R/T engines were available with either a 4-speed manual or a 3-speed automatic transmission. The 1968 Charger R/T didn’t disappoint when it came to the interior cabin. It was modern for its day yet its round dash gauges were well laid out and easy to read. Available bucket seats and a center console all added to the allure of the Charger. 1968 Charger R/T production was 17,665 units. For 1969, Dodge kept the Charger largely as a carryover from the previous year. The main exception was the full length recessed front grille of the 1968 was now replaced with a split grille. The 1968 quad round rear taillight design was now replaced with dual long horizontal rear taillights. Engine selections for the R/T carried over unchanged for 1969 along with transmission choices. Surprisingly, the 1969 Charger R/T over time has not been overshadowed by the rarer 1969 Dodge Daytona which had an extremely aerodynamic front clip and a wild rear spoiler. Part of the reason is due to the Dukes of Hazzard TV show which showcased a bright orange 1969 Charger in ever episode. 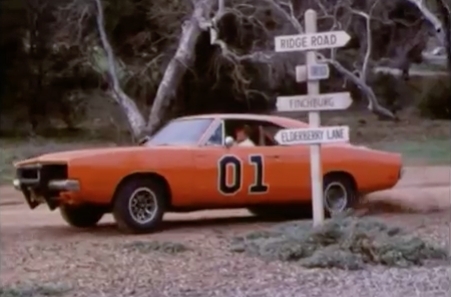 Even three decades after it’s last episode aired on primetime TV, the Dukes of Hazzard’s 1969 Charger is still one of the most famous TV cars. The 1969 Charger R/T provides the best performance and handling for anyone who loves the regular 1969 Charger body style. Total 1969 Charger production was a healthy 90,094 units, 20,057 of these were R/T models. 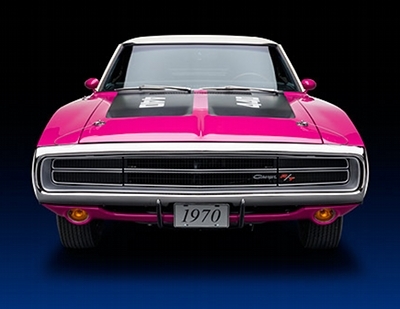 For 1970 the Charger was again back virtually unchanged however it’s length had grown an inch to 209.7 inches. The 1969’s split front grille was now replaced by a full length recessed front grille similar to that of the 1968 however it was slightly bowed and was split into two long horizontal sections. Though selecting one of Chrysler’s high impact exterior colors was first offered on the 1969 Charger, for 1970 it was a popular option. For 1970, the most popular of these colors were Sublime, Hemi Orange, and Plum Crazy. By the 1970 model year muscle car sales were down for most automakers, skyrocketing insurance costs were the main culprit. The 1970 Charger in turn also felt the pinch, production dropped to 49,768, of this output only 10,337 R/Ts were produced. Engine choices and transmission choices once more carried over again with no changes with the exception of the addition of the 6-pack 440 cubic-inch V8 option, which had three 2-barrel carburetors mounted on top of a free-flow intake manifold instead of the single 4-barrel carburetor setup which the standard 440 V8 had. The 6-pack was rated at 390 gross horsepower and could best the R/T’s 4-barrel equipped 440 by about 2 tenths of a second in the quarter mile. There would be an all-new body style for 1971 Charger, it was sleeker but just didn’t have the same flair as the 1968-1970 Charger. The only downside to the 1968-1970 Charger was that it was never offered in a convertible model, only in a 2-door coupe. But that’s a very small beef. It can’t be stressed enough the 1968-1970 Charger R/T proved that not only could Dodge produce a desirable muscle car but also a legend. Not only was the 1968-1970 Charger R/T one of the best muscle cars ever produced, it also was one of the best looking cars to ever roll off a production line.